This harness is a correct replacement for the original wiring which was used with the rare speed minder option. 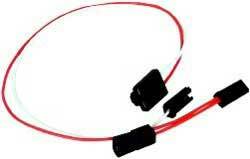 Each harness is manufactured with correct terminal ends and correct color wiring. Classic Indu stries® offers the largest selection of in stock replacement wiring harnesses available anywhere! Our harnesses are reproduced using the original General Motors schematics and feature the correct attachment connectors and wire in the correct gauge si zes and coloration (when available) to match your original and maintain authenticity.